More than 500 flights have been canceled in Chicago Tuesday as severe weather threatened to move in. NBC 5's Christian Farr has the details. More than 500 flights have been canceled in Chicago Tuesday as severe weather threatened to move in. Around 10 a.m., O'Hare reported 331 cancellations and delays of nearly an hour while Midway Airport had 40 cancellations and 15-minute delays. By 1 p.m., more than 500 flights were canceled at O'Hare "due to weather in the Chicago area" as delays of up to an hour continued. At Midway Airport, more than 80 flights were canceled. Pete Sack is tracking storms in store for the Chicago area. 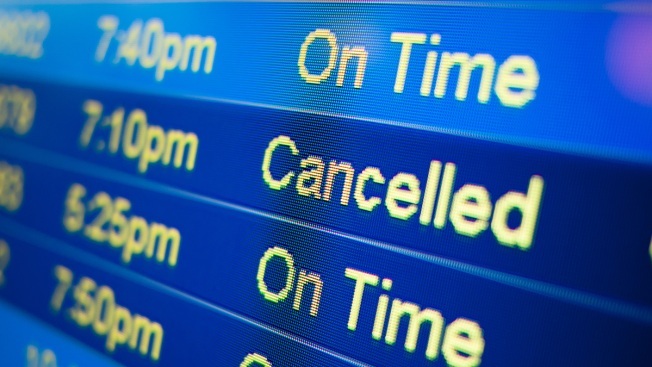 Travelers were being urged to check their flight's status with their airline. An earlier round of storms did move through parts of the area, but more severe weather was expected, threatening to bring hail, damaging winds and the possibility of tornadoes. The day is expected to be mostly cloudy, warm and humid with numerous showers and storms likely moving in during the late afternoon and evening. Some of those storms could become strong to severe, with heavy rain, damaging winds between 60 and 70 mph and quarter-sized hail possible. An isolated tornado could form as well, especially in far western counties. Part of the Chicago area sits under a slight risk for severe weather while others, particularly those along the lakefront, are in a marginal risk. The storms are forecast to end overnight, though another chance for isolated showers and storms will return through Wednesday afternoon. A Beach Hazards Alert is in effect through Tuesday afternoon for beaches in Lake County, Illinois. The alert warns of strong rip currents and wave heights of up to 5 feet. A Flash Flood Watch was also issued for much of the Chicago area, in effect from 1 p.m. Tuesday through the evening hours. The watch warns that heavy rain ahead could prompt flash flooding for some locations following recent rainfall.